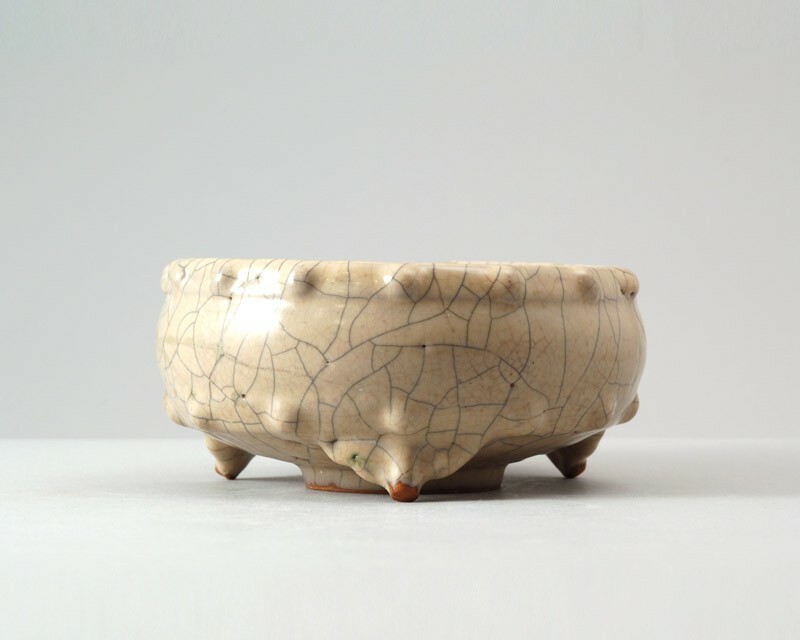 Wares with this type of opaque, beige-coloured glaze with two types of crackle, in Chinese poetically called jin si tie xian (‘golden threads and iron wires’), are known as ge ware. Unlike most other terms for Song and related ceramics, which designate the manufacturing area, ge is a collectors’ term and therefore open to interpretation. Today it is mostly used for wares from Zhejiang province with this glaze effect. This effect, which seems to be a product of variations in the firing or cooling, was achieved both by the official (guan) kilns of Hangzhou and the Longquan kilns, both of which produced predominantly green-glazed stonewares with and without any crackle. The piece has rounded sides with raised bands of bosses above and below, in imitation of a drum with pegs for holding the skins in place. It has three ruyi-shaped legs, which do not touch the ground and rests on a narrow circular foot. The glaze is very thickly applied, of opaque straw colour, and has a wide-meshed black-stained crackle overlaying a denser brownish one. The footring and lowest part of the three feet are left in the biscuit and have fired a yellowish-brown colour. On the underside the glaze has crawled and has created gaps. The inside shows five small spur marks as well as kiln grit.